Abstracts are not the most glamorous of books. There are no stories, rarely any pictures, and definitely not intended for leisure reading. However, where would we be as genealogist if not for these critical research tomes. Every individual who has taken the time to either index records or pull abstracts deserve praise and recognition for their contributions to research, especially, family history research. 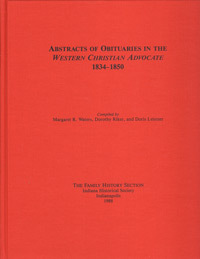 Abstracts of Obituaries in the Western Christian Advocate 1834—1850 is another of the many great abstract volumes available at Family Roots Publishing. Abstracts of Obituaries contains an colleciton of obituaries taken from the Western Christian Advocate, a Methodist newspaper. The paper began as the Christian Advocate and Journal in 1826 in New York City. Different sections of the country wanted their own paper, with more localized information, so the Methodist Church began printing The Western Christian Advocate on May 2, 1834, in Cincinnati. Shortly following, the publication opened offices in Charlestown, South Carolina; Nashville, Tennessee; and Pittsburgh, Pennsylvania. This abstract covers Western Christian Advocate printings from 1834 to 1850. The newspaper grew from 14,000 subscribers in 1840 to 18,000 by 1850. As many as 20 obituaries were listed in a single issue. Reports of deaths came predominately from Ohio, Kentucky, Indiana and other mid-western states. There are, however, abstracts from other states as well. Margaret R. Waters, Dorothy Riker, and Doris Leistner are credited with the abstraction work for this volume. In some records the actual death date and place were not available. In these cases the date of the obituary and its author’s residence are used. These can serve as clues for searching additional information regarding exact death date and location. In all, this book contains nearly 8,000 obituaries.